Fungus-based design and construction is part of a growing movement toward sustainable, biologically-derived materials. Some, like architect Ginger Krieg Dosier of bioMASON in Durham, North Carolina, use bacteria to produce cement and bricks. Others use organisms for self-healing concrete, or environmental clean-up, or lab-grown substitutes for leather (which will make all the vegan goths out there happy). The fundamental principles of bio-building and bio-design include minimizing building-related waste of all types. In the US alone, building construction and demolition produce over 500 million tons of waste annually and account for about 40 percent of US energy consumption. On a global scale, buildings contribute nearly a fifth of humanity’s total climate-warming greenhouse gas emissions. “The building industry is responsible for a large amount of environmental footprint that humans undertake,” Maurer told Earther. A desire to change that drives his work, and that of other bio-builders. Multiple companies are poised to commercialize on the science, but at present things are still on the level of workshops, not factories. Maurer’s workshop occupies one end of a big warehouse, shared with contractors of a more ordinary sort. His space is part lab, part growing shed, with a strong whiff of socially conscious politics mixed in with the organic smells. A block of mushroom wood is stamped with Jimi Hendrix’s face, a reference to the studio’s name; a well-thumbed book titled Radical Mycology lies open on one of the tables. Plastic enclosures mark off the places where the mushrooms are growing. Not that any actual mushrooms are in evidence. The caps and stems we eat are only part of the fungus, and the least useful part for creating so-called mycoterials. In Maurer’s analogy, you wouldn’t build furniture from the fruit of the tree, so you wouldn’t make mycoterials from the cap of the ‘shroom. Many things can serve as food for the fungus, as long as they contain cellulose, one of the most common carbon compounds. 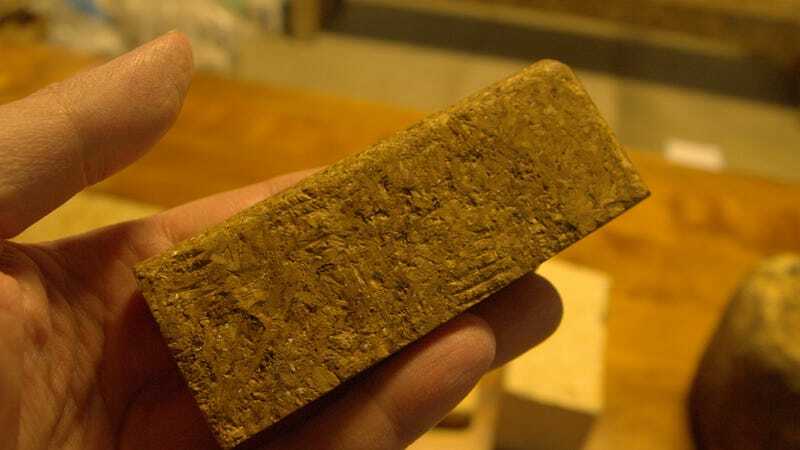 The stalks of wheat once the grain has been harvested, wood from demolished buildings, and hemp—a byproduct of textile or marijuana production—are particularly promising starting materials. Once a raw material is chosen, it needs to be pasteurized: heated to kill off bacteria and other fungi. That’s to prevent those other organisms from competing with the mycelium introduced to make the “wood”. Chris Maurer holds a bag of rye grain infused with liquid mycelium, so that it “spoils”. The white material is the fungus breaking down the cellulose in the grain and fusing it together. When Maurer hands me a plastic bag full of rye grain infused with oyster mushroom mycelium, the sight immediately triggers disgust. The grain looks spoiled, and my evolutionary reaction tells me to stay away. But the spoilage is exactly what we want here: the white, slimy, gooey-looking mycelium is growing between the rye berries and interpenetrating the plant cells of the grain, fusing everything together in one solid mass. The result is an extremely versatile, flexible, and strong material. According to Redhouse lab tests, their mycoterial is as durable as concrete in certain areas of performance, while being able to flex without rupturing the way wood does. “We can produce materials that are structural, insulating, fire resistant, and sound attenuating,” Maurer said. Redhouse Architecture’s committment to bio-building grows out of a recognition that many building materials we take for granted, from wood to water to stone, aren’t accessible in other parts of the world. And even in the U.S., those resources might not be around forever. he growing room is a plastic tent with a humidifier pumping out moisture. Plastic containers contain straw from agricultural waste, which have been inoculated with mycelium to make wood-like planks and sheets. That last point is essential: because all the raw ingredients are biological, they’re easily recycled. In fact, waste from a mushroom-materials project could be recycled into new mycoterials. To hear Maurer speak of it, it’s almost miraculous. But don’t expect toadstool houses to mushroom immediately. Right now, the operation is entirely proof of concept—Redhouse’s current mycotecture clients are all small local businesses, along with a potential municipal project. Redhouse needs a lot of funding to expand to doing humanitarian mycotecture, whether overseas or in the U.S.
Other researchers are pioneering different bio-building approaches. Ginger Krieg Dosier’s company bioMASON hopes to release its first commercial products within the next year or so. Although her academic background is architecture, Dosier draws inspiration from microbiology. She notes that some species of bacteria have been building reef-like structures for billions of years, long before corals were around: the blobby objects called stromatolites are among the earliest-known signs of life on the planet. An experimental hemispherical mold for mycoterials. This particular example is the process of drying. These organisms manipulate the chemistry of their environment to extract minerals from the water, and extrude them into concrete-like substances. They don’t need to heat things up, like we humans do to bake clay into bricks, or waste large amounts of water to form their materials. And many organisms use carbon dioxide rather than produce it as waste. “Using bacteria to manufacture cement materials—‘biological stone’—eliminates carbon dioxide emissions,” Dosier said. Her LEGO-sized prototype won her the 2010 Metropolis Next Generation Design Competition. Since then, her company has scaled up to normal sized bricks, pavers, and other masonry, using a combination of grants and institutional support to turn the concepts into something that can be commercialized. By some estimates, by mid-century climate refugees could outnumber all but the most populous nations in the world. Even today, feeding and housing refugees is a crisis of a scale humanity has never seen. Biologically-derived materials won’t solve those problems, but they could help. The challenges, of course, are manifold. Maurer’s company, for instance, is quite small, and while he’s applied for grants to scale up, his optimism is couched in “ifs”: if they get funding, if humanitarian organizations adopt and adapt some of their plans, if local organizations and governments cooperate with them on their projects. Then there are the usual problems of convincing people to adopt green technology. Construction and its associated industries involve many types of products, and at its current scale biobuilding can’t overtake any of them right now. Even mycoterials require protection from moisture, the way wood needs to be treated against rot, and it’s unclear whether that can be done in as green a manner as the rest of the process. Though we won’t see biobrick or fungus-wood buildings right away, the materials are promising. A bit like where green energy was decades ago, these companies are small but with big dreams. Whether biobuilding can grow the way renewables have is a matter of hope. Matthew R. Francis is a physicist, science writer, public speaker, educator, and frequent wearer of jaunty hats.